On Wednesday a pair of House Committees began considering Republicans’ Affordable Care Act (ACA) repeal legislation, the first formal step toward consideration of that legislation by the full House of Representatives. Congressional Budget Office (CBO) estimates of the effects of this legislation are not yet available, and it appears they will not be available until after both committees have voted on the bill. In anticipation of the official CBO estimates, this blog post draws upon prior CBO estimates and analysis to assess how CBO will likely expect this legislation to impact insurance coverage. The table below illustrates the CBO’s likely estimates for this legislation. There is significant uncertainty about exactly how CBO will model these provisions and how it will expect the various provisions to interact with one another. Nonetheless, we conclude that CBO’s analysis will likely estimate that at least 15 million people will lose coverage under the American Health Care Act (AHCA) by the end of the ten-year scoring window. Estimates could be higher, but it’s is unlikely they will be significantly lower. As a starting point, CBO recently estimated the effect of one important provision of the House legislation: repealing the individual mandate. CBO estimated that repealing the mandate would cause many people, especially healthy people, to drop their insurance coverage. That, in turn, would drive premium increases in the individual health insurance market, causing still further coverage losses. In total, CBO estimated that individual market premiums would rise by 20 percent and that 6 million people would lose individual market coverage by 2026. 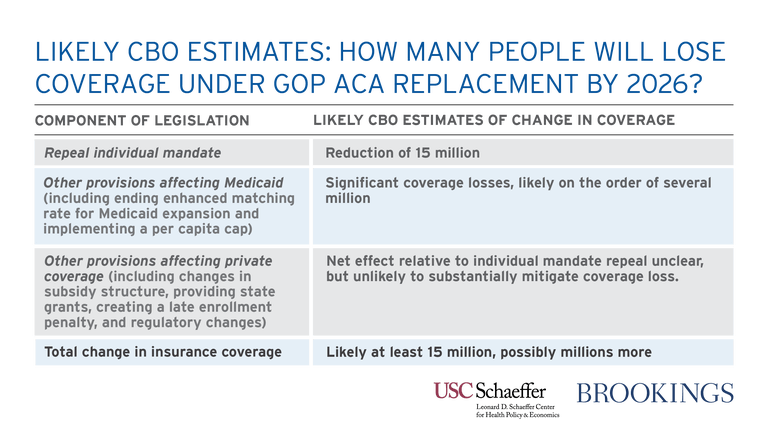 On top of that, CBO estimated that repealing the individual mandate would reduce the number of people with employer coverage by 2 million and reduce Medicaid coverage by 7 million, bringing the total coverage loss to 15 million. The legislation’s provisions curtailing federal support for state Medicaid programs would add substantially to these coverage losses—likely several million more. First, the legislation would reduce the share of Medicaid costs that the federal government pays for low-income adults in the ACA’s expansion population, from 90 percent under current law to each state’s regular Medicaid match rate; the regular matching rate varies across states but averages 57 percent. The legislation would allow states to continue receiving the enhanced match rate for individuals who are currently eligible until those individuals leave the program. However, due to income fluctuations and other factors, relatively few people remain continuously enrolled in Medicaid for years at a time. As a result, by the end of ten-year scoring window, this provision to reduce the Medicaid match rate would differ little from simply eliminating the enhanced match rate entirely. The coverage losses associated with curtailing federal funding to Medicaid expansion states will likely be significant. Under current law, CBO estimates that the number of Medicaid enrollees who are eligible because of the ACA totaled 12 million in 2017 and will grow to 17 million in 2027, driven largely by additional states deciding to take up expansion. Even after accounting for reductions in Medicaid enrollment attributable to repeal of the individual mandate, discussed above, more than 10 million people would be projected to remain in the expansion population in 2027. Because of the increased cost to states under AHCA, additional expansions will be much less likely to occur, putting much of the projected increase in expansion enrollment at risk. CBO is also likely to expect that some states that have already expanded will end their expansions; indeed, this will occur automatically in states whose expansion legislation makes the continuation of the enhanced matching rate a condition of continuing expansion. Given their low incomes, the substantial majority of individuals losing Medicaid coverage would become uninsured, particularly in light of the reductions in financial assistance for individuals seeking individual market coverage discussed below. All told, it seems likely that CBO would project coverage losses in this group on the order of an additional several million. In addition to ending the enhanced matching rate for Medicaid expansion, the legislation would impose a “per capita cap” on state Medicaid programs. Under the House’s proposed per capita cap, the per enrollee amount on which states could receive federal matching funds would be capped at the state’s fiscal year 2016 level of per enrollee spending, adjusted for growth in the Consumer Price Index for Medical Care and the share of Medicaid beneficiaries in different eligibility categories. Analysis by the Center on Budget and Policy Priorities finds that the cap would fall short of accommodating projected growth in states’ Medicaid costs, in part because linking the cap amounts to a price index would not accommodate changes in health care utilization over time. Moreover, as the CBPP analysis notes, this likely understates the provision’s impact. Under the proposed per capita cap, states receive less federal funding if their spending is above the cap, but receive the same funding they otherwise would if spending is below the cap. This one-sided risk has the effect of magnifying the expected impact on states, since the lost funding if spending turns out to be higher than projected is not matched by higher funding if spending turns out to be lower than projected. CBO’s standard practice is to take account of this kind of “one-sided bet” when scoring program changes, and they are therefore likely to project larger state funding losses. It is uncertain how CBO will expect states to cope with those shortfalls. CBO has previously identified four broad ways in which states could respond: finding additional funds elsewhere in their budgets; reducing provider payment rates; reducing the quality and extent of the benefits they provide; and curtailing eligibility or outreach for certain beneficiary groups. It seems most likely that CBO will assume that states take some combination of these four paths. This suggests that CBO will score this provision as causing additional coverage losses, although the magnitude of those losses is unclear. The legislation would also make additional major changes affecting the individual health insurance market. Most important, the legislation would repeal the ACA’s premium tax credits and cost-sharing reductions, which help low- and middle-income people purchasing individual market coverage pay their premiums, as well as out-of-pocket costs like co-payments and deductibles. In the place of the ACA’s premium tax credits and cost-sharing reductions, the legislation would introduce a new tax credit with a markedly different structure. Under the ACA, the premium tax credit is based upon the actual cost of the coverage options available to an individual in their area; it is most generous for the lowest-income individuals and phases out gradually as income rises, with eligibility ending at 400 percent of the federal poverty level, $47,520 for an individual and $97,200 for a family of four in 2017. By contrast, the new tax credit would have the same dollar value everywhere in the country and would be adjusted only by age, not the cost of coverage in an individual’s local area; the value would be the same at all income levels up to $75,000 for an individual and $150,000 for a family, above which the credit amount phases down gradually. Rather than rising with premium costs, like the ACA’s tax credit, the value of the tax credit would rise with the Consumer Price Index plus one percentage point. As illustrated in work by researchers at the Kaiser Family Foundation, the new tax credit would be substantially less generous for lower-income people, particularly those who are older and live in higher-cost areas. However, many higher-income people would qualify for larger tax credits, particularly young people who live in low-cost areas. Incorporating the elimination of cost-sharing reductions would likely magnify this pattern. This complex pattern of changes in the value of the tax credits makes it challenging to predict exactly how CBO will expect this provision to affect insurance coverage, as it will depend crucially on how different population groups respond to the changed incentives. However, it is possible to make some educated guesses based on information that is available. To start, it seems safe to assume that, in the aggregate, the House Republican legislation will not spend more and may spend considerably less on individual market subsidies than the ACA, particularly in the long run. To see why, note that Republican leadership appears to wish not to increase deficits in this legislation. Indeed, the terms of the reconciliation instruction that Republicans intend to use to pass AHCA require this legislation to be at least deficit neutral in order to avoid a filibuster in the Senate. The legislation implements tax cuts costing about $600 billion over ten years, creates new state grants costing $100 billion over that period, and will incur significant additional revenue losses from repealing the ACA’s employer mandate. Thus, increasing total spending on tax credits while avoiding an increase in the deficit is likely impossible, even taking into account the bill’s Medicaid cuts. And since House Republicans have reportedly received private CBO scores of prior versions of the bill that included this tax credit, drafters should have had enough information to adjust the size of the tax credits in order to ensure that spending on the credits does not exceed that level. Note also that even if AHCA spends the same amount as the ACA on individual market subsidies over the ten year window as a whole, the AHCA subsidies are particularly likely to fall short of the ACA subsidies in the later years of the budget window due to the slower indexing rate that applies to the new credits. With a comparable or smaller pot of subsidy dollars, the only way to increase insurance coverage is if the dollars are redeployed in a way that is more efficient in increasing insurance coverage. The shift of subsidy dollars toward higher-income individuals is likely to make the subsidies provided under the AHCA less efficient in increasing coverage, for two reasons. First, CBO has indicated in the past that it assumes that higher-income individuals’ coverage decisions are less responsive at the margin to changes in subsidies. Second, CBO has similarly indicated in the past that it believes subsidies become particularly effective as they approach 100 percent of the gross premium; spreading subsidies more thinly over a larger population will tend to reduce the number of people with very low net premiums. Third, coverage rates are higher at higher income levels, so a larger fraction of additional subsidy spending on high-income individuals goes to people who would have enrolled anyway. The effects of shifting subsidies toward lower-cost areas are more complex, and the net effect on coverage is unclear. On the one hand, shifting subsidies toward lower-cost areas will likely increase the number of people with very low net premiums. On the other hand, to the extent that coverage rates are already higher in these areas due to their lower costs, a larger fraction of subsidy dollars will go to people who would have purchased coverage anyway. There is also a real risk that the very large reduction in subsidies in high-cost areas would threaten the stability of the individual market in these areas. CBO stated in its estimates of so-called “repeal and delay” legislation that fully eliminating subsidies would risk a near-complete unraveling of the individual market as healthy individuals dropped coverage, driving premium increases that spurred still larger coverage losses. In some high-cost areas, the magnitude of the loss in subsidies would be very large in proportional terms, raising a similar prospect of substantial unraveling in these markets. 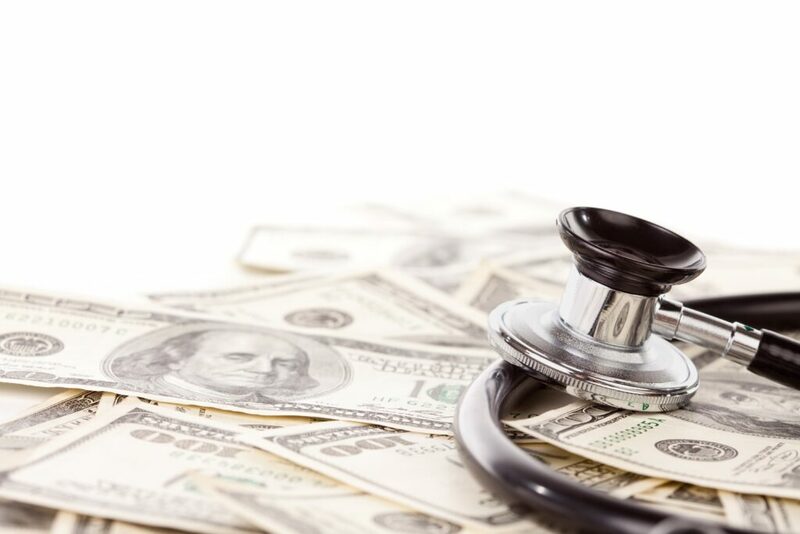 A final consideration is that the availability of premium subsidies at higher income levels, combined with the elimination of the ACA’s employer mandate, may increase the likelihood that a significant number of employers drop coverage. This might be particularly likely in low-cost areas since the tax credits will be particularly valuable relative to the existing tax preference for employer coverage and may be comparatively more successful in ensuring a stable individual market. It was rumored that CBO predicted such changes under the initial leaked draft bill. CBO estimates of legislation modifying the employer mandate imply that repeal of the employer mandate by itself would have only a small impact on the number of people with employer coverage and the number of uninsured. But the broader availability of subsidies could cause much larger reductions in employer coverage. While most of the employees losing coverage would obtain health insurance through the individual market or Medicaid, if this occurred, it would likely cause some drop in overall coverage levels. With different aspects of the change in subsidy structure pointing in different directions, it is not possible to be certain about the net effect on insurance coverage without a more detailed analysis like the one CBO will soon provide. However, our best guess is that the reduction in the overall size of the subsidies, combined with the shift of subsidies toward higher income levels and the risks to the stability of the individual market in high-cost areas will outweigh any benefits from shifting subsidies toward younger adults, leading to a reduction in coverage overall. At a minimum, we doubt that these provisions will significantly mitigate the coverage losses from repeal of the individual mandate. There are two other provisions included in the legislation, not discussed above, that may drive some increase in insurance coverage. The first is introducing a late enrollment penalty for people who do not maintain “continuous coverage.” This penalty would require individuals who enroll in individual market (or small group market) insurance coverage and had a break in coverage during the prior year to pay the insurer an additional premium equal to 30 percent of the cost of their plan for one year. The logic of this provision is that more people will purchase coverage today in order to avoid having to pay a higher premium later. Because CBO has not previously released an estimate of a similar provision and the economics literature on this type of provision is limited, we are uncertain what CBO will conclude about the penalty’s effectiveness. There is, in our view, good reason to question how effective this type of penalty is likely to be. Many people who purchase coverage will likely not place significant weight on the penalty, either because they do not understand it, expect to have coverage from a large employer or Medicaid in the future, or simply do not anticipate needing coverage in the near term. In addition, unlike the individual mandate, a late enrollment penalty is also unlikely to have substantial effects on coverage decisions outside the individual market. Nevertheless, it is plausible that CBO will conclude that this type of incentive has some positive effect on insurance enrollment decisions. The second relevant provision is ACHA’s “Patient and State Stability Fund.” The Fund would give states grants that they could use for a variety of health-care-related purposes, some of which (like providing additional financial assistance to individuals or operating a state-funded reinsurance program) could promote higher health insurance enrollment. Over most of the ten-year budget window, the legislation would provide states with $10 billion annually, although no grants are offered for 2027 or later, so the program would have no effect on coverage in the long run. Even focusing on the years where funding is provided, however, it is doubtful that CBO will score large effects on insurance coverage. For one, these amounts would be relatively modest in relation to total individual market premiums. Calculations based on CBO’s January 2017 baseline projections imply that CBO expects aggregate individual market premiums to be on the order of $175 billion in 2026, after accounting for repeal of the individual mandate. This implies that the best case scenario is that these funds could be used to achieve a roughly 6 percent reduction in individual market premiums in 2026, accounting only for the federal funding, or around 9 percent after accounting for the matching contribution states would be required to make under the program rules. A premium reduction of this size would likely have only a moderate effect on individual market enrollment. Moreover, CBO’s estimate of the actual effect of these grants is likely to be considerably smaller than this best case scenario. CBO will only score the grants as affecting insurance coverage to the extent that the funds will be directed toward activities that will increase insurance coverage and the activities are ones that states would not have undertaken in the absence of the grant funds. Given the high degree of flexibility states will have in determining how these funds are used, it is likely that CBO will conclude that at least one of these conditions will fail to hold for a large fraction of grant dollars. CBO previously estimated that repealing the individual mandate would cause 15 million fewer people to have health insurance. From our analysis, it appears unlikely that potential coverage gains from the legislation’s late enrollment penalty and grants to states are enough to make up for the additional coverage losses from the elimination of the enhanced federal match rate for the ACA’s Medicaid expansion population and the legislation’s per capita cap. The precise coverage impacts of the legislation’s changes to the structure of individual market subsidies are uncertain, but our view is that the CBO will mostly likely conclude that these provisions result in a reduction in individual market coverage that adds to the coverage losses caused by repeal of the individual mandate. Altogether, then, it’s plausible that the AHCA will increase the number of uninsured persons by more than 15 million, and unlikely that we’ll see a number much less than 15 million from the CBO. Editor’s Note: This analysis is part of The Leonard D. Schaeffer Initiative for Innovation in Health Policy, which is a partnership between the Center for Health Policy at Brookings and the USC Schaeffer Center for Health Policy & Economics. The Initiative aims to inform the national health care debate with rigorous, evidence-based analysis leading to practical recommendations using the collaborative strengths of USC and Brookings. This analysis focuses on effects on insurance coverage at the end of the ten-year window because some of the provisions of the legislation would phase in gradually over time. At least a portion of the reduction in Medicaid enrollment attributable to repeal of the individual mandate would likely be in population groups that were previously eligible for Medicaid. Estimates by Matthew Buettgens and Genevieve Kenney of the Urban Institute imply that, under current law, around half of the individuals gaining Medicaid coverage when a state expands would otherwise have been uninsured. That fraction would likely be substantially higher under ACHA because individuals with incomes between 100 and 138 percent of the Federal Poverty Level who lose Medicaid coverage would be eligible for much less generous financial assistance to purchase individual market coverage than they are today. For these purposes, the relevant measure of costs includes not only the direct spending on individual market subsidies under the two bills, but also any effects on the cost of the tax exclusion for employer-sponsored coverage. To the extent that the two credit structures generate different levels of employer coverage, differences in this latter component could be important. CBO projects that the aggregate amount of premium tax credits claimed in fiscal year 2026 will be $83 billion. In 2016, premium tax credits covered around 73 percent of the gross premium for subsidized enrollees, suggesting that total projected premium payments for subsidized enrollees would be around $114 billion in 2026. CBO projects total individual market enrollment of 20 million for 2026 versus subsidized enrollment of just 11 million, so this implies that aggregate premiums in the individual market as a whole would be around $207 billion. Finally, to adjust for repeal of the individual mandate, we increase this amount by 20 percent to account for the resulting increase in premiums, then scale it down to by the ratio of 14 million to 20 million to account for lower individual market enrollment, leading to a final estimate of $174 billion.